At the Vernee booth, as Vernee is the first to announce their upcoming 10nm Vernee Apollo 2 smartphone, running on the Helio-X25 in the Vernee Apollo, they are introducing their French startup software partner Auxens presenting the OXI Android OS Android Continuum platform! 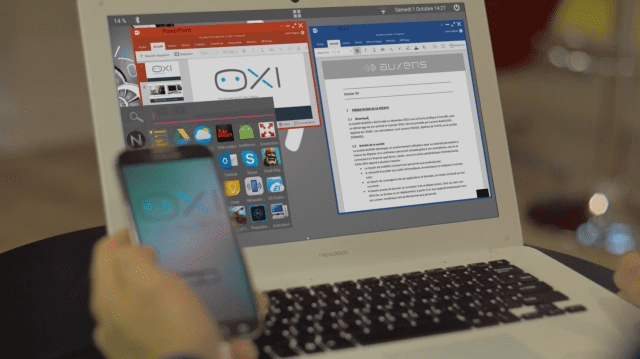 OXI is a slightly modified Android OS (adding in a few extra APIs to the normal Android firmware), it can display a desktop-like user interface with multitask features such as multi resizable windows, desktop, notifications, "Start menu" and more. It can also display this interface on the external display using DisplayLink, wireless (miracast or chromecast) or by mhl or slimport. Meanwhile the smartphone screen is still completely usable and independent, with regular Android. OXI is compatible with any current Android app. It doesn't require any specific action from the apps developers. MediaTek's Tri-Cluster 10-core design features dual-core ARM Cortex-A73 at up to 2.5GHz, quad-core ARM Cortex-A53 at up to 2.2GHz and quad-core ARM Cortex A35 at up to 1.9GHz, with some really interesting features including low heat, high performance, 4K HDR, 4G LTE-Advanced WorldMode modem that uses 3x Carrier Aggregation with performance of 450MBit/s. MediaTek Helio X30 increases performance by up to 35% and saves power by up to 50% over the MediaTek Helio X20. CorePilot 4.0 with Centralized, Intelligent Task Scheduling, Thermal The 10nm fabrication by TSMC increases performance by up to 22% and saves power by up to 40% versus 16nm. The 450MBit/s with 3x Carrier Aggregation downstream and 150Mbit/s with 2x Carrier Aggregation upstream for high volume content streaming and reliable connectivity. Category 10 4G LTE-Advanced WorldMode modem features new ETM 2.0 and TAS 2.0 technologies that saves battery power in everyday use by up to 35%, and up to 45% on multimedia specific scenarios. - Programmability and Flexibility: The VPU provides a platform that allows brands the ability to customize camera functionality and drive product differentiation. - Huge Power Reduction: The VPU is a dedicated camera-assisting hardware unit it has the ability to perform real-time processing functions, that were typically assigned to CPU or GPU, with only 1/10th power usage. - Performance Boost: The VPU can still be used in isolation or as part of a team with the CPU/GPU, employing heterogeneous computing on same memory subsystem for advanced system or multi-application/function tasks. The Helio X30 is the World's first mobile SoC to bring a power efficient, hardware-based HDR cinema viewing experience to mobile devices. While other newly announced 4K HDR Smartphone SoCs might be doing the 4K rendering work in software, the X30 does it in hardware. 4K HDR10 standard offers a dynamic range of up to 10,000 nits. Paired with the latest, premium display technologies yields a never-seen-before quality and a true-to-life viewing experience. MiraVision EnergySmart Screen is MediaTek's advanced power saving technology for mobile displays, reducing power consumption (up to 10% of device's total power or up to 25% of panel power, depending on brightness) while preserving viewing experience. MediaTek Instant Auto Exposure (AE). The dedicated Camera Control Unit (CCU) hardware delivers considerably faster, automatic exposure adjustment when environmental lighting conditions change suddenly. AE convergence speed is up to twice as fast as competitive auto exposure performance. 4x16-bit LPDDR4X 1866MHz memory is up to 50% more power efficient than previous generation LPDDR3, while also delivering up to 50% more performance. The fully customized IMG PowerVR 7XTP-MP4 @ 800MHz is designed for lowest power usage while still delivering incredible performance. It saves up to 60% power versus while increasing performance by up to 2.4 times compared to the Helio X20. The shoot 1 from DOGEE is a their latest entry level Android phone with a Sharp 5.5" (full hd) display, MTK MT6737 64bit Quad-core ARM Cortex-A53 with Mali-T720MP2 GPU, an 8mp front camera, 13mp + 8mp back camera, 16b of rom and 2gb of ram. The price for Shoot 1 can be around $90 for distributors who buy 100 - 1000 pieces depending on the country. iNew is a smartphone manufacturer that demos here their L7 model with a 5” AMOLED display, dual-core processor (options up to octa-core), metal back with a fingerprint sensor, an 1800mAh battery, and it runs Android 5.1 (upgradeable to v6). Price quoted is around US$69 for 3k units. The U9 is a 6” model with a 3000mAh battery, quad-core processor, 2.5D curved glass display, 8MP+2MP camera config, and LTE connectivity. Their smartwatch displays real-time heart rate, sleep quality, blood pressure and steps taken, and costs US$120 approx. Lastly, on display are their smartphones, with the cheapest one selling for US$30 approx with an MTK6580 chipset, 1GB RAM, and 4” display. Emdoor shows us here their Android laptop with 11.6” 1366x768-pixel display, MT8173 chipset with 2xCortex-A53 and 2xCortex-A72 cores, PowerVR GX6250 GPU, 1/2GB DDR3 RAM, 16-64GB of NAND storage, running Android 6.0 Marshmallow, USB Type-C, HDMI port, a hinge that can swivel 270° and a 6-7hour battery life. 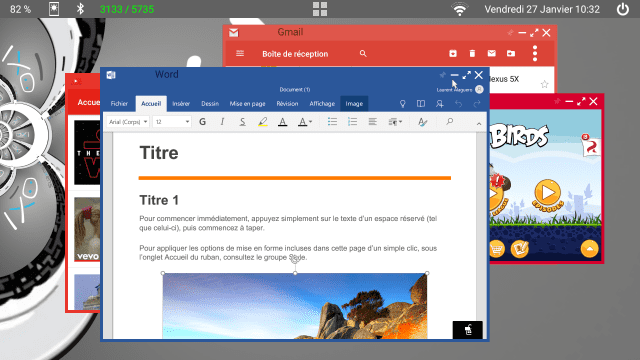 The optional Remix OS allows one to run PC apps as well.